Sticky Labels Blog | How To | Our Favourite Guerrilla Marketing Campaigns: Using Stickers! Guerrilla marketing is everywhere: a low-cost advertising option that can, if done well, see a huge return on investment. This type of marketing is a more unconventional way of getting a brand’s message across – often used by smaller businesses with lower marketing budgets, but also now being used more widely by big name brands. Guerrilla marketing campaigns are generally highly creative and are designed to get people talking and sharing the brand’s ideas, creating a positive buzz about the company or its products and services via word of mouth. The use of stickers and labels in guerrilla advertising is very popular, as it is a relatively low cost of producing hundreds or thousands of branded items that can be distributed with ease. Labels, such as the ones that we offer, are easy to customise – probably one of the main reasons why their popularity has soared. Take Cillit Bang’s “Clean Coin” campaign in Germany, for example. In order to demonstrate the cleaning power of Cillit Bang, supermarket cashiers handed out 5 cent coins – half cleaned by Cillit Bang and half still dirty, with a transparent branded sticker on one side – as a change to customers. 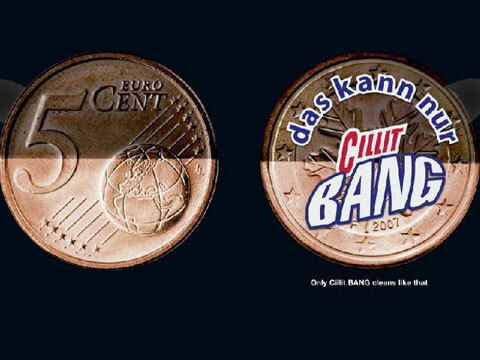 As a result of the campaign, the supermarkets where it was used saw an uplift of 337% in Cillit Bang sales: proof that the simple label can make a big difference when used as a marketing tool. 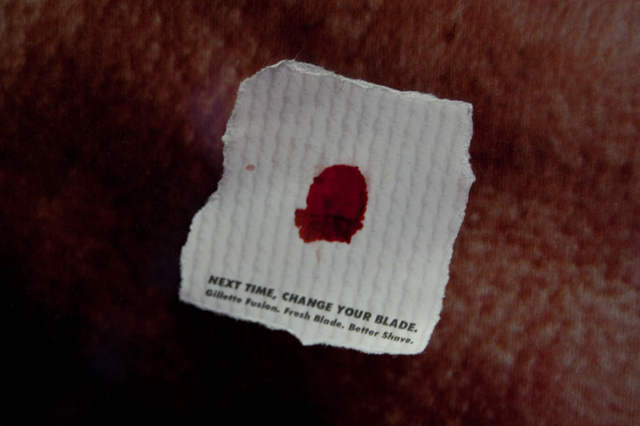 Dermagraphic Tattoos used stickers in their own guerrilla marketing campaign, aiming to get potential customers to “try before they buy”. 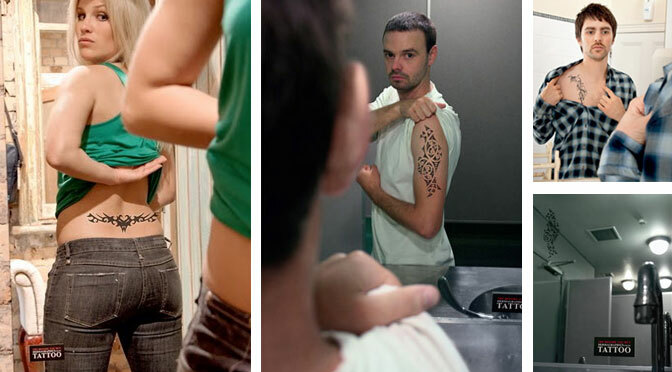 They placed stickers that were designed to resemble tattoos on the mirrors of public bathrooms and changing rooms, meaning that members of the public could like up their arms, chests and other body parts against the tattoos to see what they would look like. 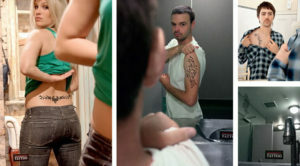 A clever campaign from the brand, which made people who had never previously thought about tattoos consider what they may look like. Elmex are another brand who have used stickers and labels creatively in a number of ways. The European toothpaste brand had a successful campaign using bowling balls in Israel, ordering 140 bowling balls that were distributed amongst the branches of Israel’s largest bowling alley chain. 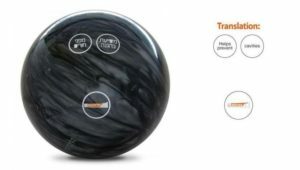 The only difference between these bowling balls and the standard balls used at the alley was that these special balls had no holes. Instead, they featured three stickers at the points where the holes would normally be found, advertising the efficiency of the toothpaste in protecting against cavities. The same brand also highlighted that stickers need not be overly complicated in their design to be successful – even the most basic of labels can make an impact. They worked with 15 of the most popular health and fitness clubs in Israel to produce a campaign that used the lockers of the clubs to demonstrate just how well their toothpaste performs. Two rows of lockers had their doors covered with stickers which made them resemble a mouth full of teeth – each locker representing a single tooth. When a locker was opened, it gave the impression of a missing tooth – and further brand promotion was achieved via the toothpaste sample and information about the brand that was placed inside each locker. Gillette created a very successful guerrilla marketing campaign that used labels in a high traffic area of Manhattan, collaborating with billboard advertisers to run a campaign that really did stand out. The shaving company created a number of relatively small labels, all of which were designed to resemble pieces of tissue covered in blood. These stickers were then affixed to the faces of male models on existing billboard campaigns, making it look as though these models had cut themselves while shaving – and suggesting to those seeing the ads that it may be time for them to switch to a Gillette blade. Our final example of creative guerrilla marketing using stickers comes from shampoo brand Pert Plus, who used the sinks of public bathrooms as the medium for their cleverly designed stickers. The brand was competing against 6 other shampoo brands that claimed to reduce hair loss, and needed to stand out. Their transparent, waterproof stickers were affixed next to the plug holes of basins in universities, shopping centres and other public buildings, and resembled a strand of hair that had curled round into the shape of a hand, trying to avoid being washed down the plug hole. A clever and humorous campaign that was designed for maximum appeal to younger consumers. Design your own Guerrilla Marketing stickers here!